Place Rocket in a large bowl. 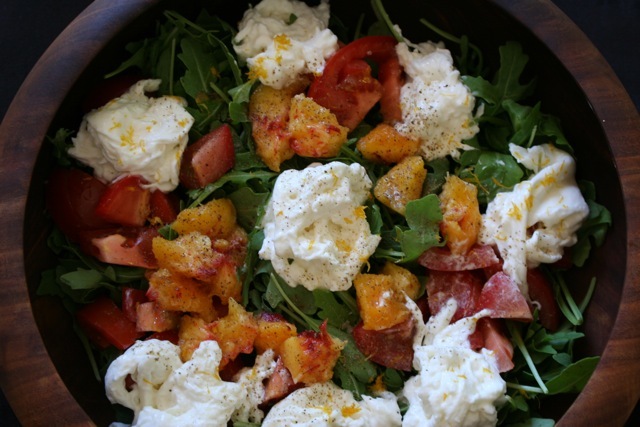 Tear Peach and Burrata onto greens. Add Tomato. Sprinkle with zest , salt and pepper. Cut Lemon in half and squeeze juice of half onto salad , add a generous drizzle olive oil over top. Toss and serve. This entry was posted on Tuesday, July 19th, 2016 at 2:57 am	and posted in Category. You can follow any responses to this entry through the RSS 2.0 feed.